When Coraline explores her new home, she steps through a door and into another house just like her own - except that things aren't quite as they seem. There's another mother and another father in this house and they want Coraline to stay with them and be their little girl. 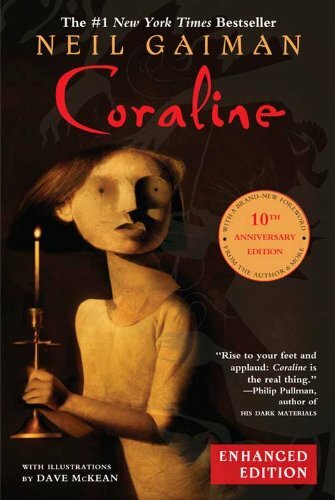 Coraline must use all of her wits and every ounce of courage in order to save herself and return home... but will she escape and will life ever be the same again? Elsewhere in this collection, a sinister jack-in-the-box haunts the lives of all the children who ever owned it, a stray cat does nightly battle to protect his adopted family, and a boy raised in a graveyard confronts the much more troubled world of the living. From the scary to the whimsical, the fantastical to the humorous, Coraline and Other Stories is a journey into the the dark, magical world of Neil Gaiman. 7/8/2016 Linda Rae Apolzon said: This book deals with a common childhoodl fear--someone else is in your mother's body! Coraline is a great character, and the book hits the perfect balance of very creepy but not too much for a kid to handle. It's too scary for adults. 8/30/2011 Gail Fattori said: Even better than the film, which I am reluctant to say is what got me to read the book. I love it though. 6/25/2010 Jennifer Brundage said: This was much more intense than I thought it would be with much gruesome imagery. A very primal and fairy tale feel, admirable pacing. I am still 'digesting' it! 3/18/2010 Will Strong said: The best kind of creepy story. Wildly imaginative in a very real sort of way. The darker side of fairy tales as only Neil Gaiman can do. Interesting twist on the other world leaving one almost hoping they don’t find a portal to a parallel universe. The vision of the dark halls, the misty surrounding and the creepiness of the other mother was well written, easily imagined and slightly disturbing. In other words, well written and I am more eager now to see the movie that is based on this book than I was before. The book was different than what I had been expecting based on the Movie promotions. 6/14/2009 Laura J. Holman said: Engrossing. It was a favorite in my son's literary circle at school. Highly recommend. Add your reply to Laura J. 2/17/2009 jenny link said: This was fun to read and easy to imagine. The imagery depicted was so reminiscent of Tim Burton it no wonder they made a movie. At points it was so eerie that the hairs stood on the back of my neck :) I thoroughly enjoyed the journey of this tale. 1/29/2009 Lisa Knasiak said: Didnt we all, as kids, wish we could have "fun" parents? A wonderful cautionary told in Gaimans usual quirky fashion. 9/25/2008 celia Leary said: Fabulously creepy and genuinely scary book for brave kids. 10/16/2007 Diane Smith said: Weird, but good! Probably the creepiest book I've read all year. Gaiman's style, however, is amazing and all Gaiman. He manages maintain a sense of complete control while allowing the world around Coraline to more or less fall apart. An amazing work of horror fantasy that will hopefully hook even the most reluctant of readers into reading.